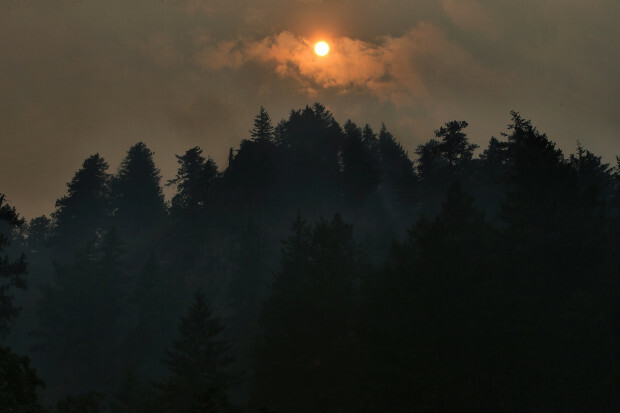 Smoke clouds from the Eagle Creek Fire obscure the sun above Multnomah Falls, Wednesday, Sept 6, 2017, near Troutdale, Ore.
DENVER — Acrid yellow smoke clogs the skies of major Western U.S. cities, a human-caused fire in the Columbia River Gorge rains ash on Portland, Oregon, and a century-old backcountry chalet burns to the ground in Montana’s Glacier National Park. “It was kind of a bad combination of things,” Henry said. It’s making things worse for fires, said Jonathan Overpeck, dean of the School for Environment and Sustainability at the University of Michigan. Hotter and drier weather is a symptom of human-caused climate change, and that’s making fires worse by leaving forests and other vegetation more flammable. “Humans are contributing to an ever-increasing degree to wildfires in the West as they emit greenhouse gases and warm the planet and warm the West,” Overpeck said. Two dozen species of beetles have killed trees on nearly 85,000 square miles (220,000 square kilometers) in the Western U.S. since 2000. They’re responsible for about 20 percent of the 6.3 billion standing dead trees across the West, according to the U.S. Forest Service. “We’re stretched thin,” said Jennifer Jones, a spokeswoman for the interagency fire center. Sometimes the center gets requests for more crews and equipment than it has, so “fire managers on the ground are adjusting their tactics and strategies to accommodate the resources they can get,” Jones said. “It’s a better-informed public and fire services better able to fight fire,” she said. “It’s unusually bad,” said Henry, of the National Interagency Fire Center. Smoke is lingering from northern California and central Nevada to Montana. The air over parts of northern California, Idaho, Montana, Oregon and Washington is rated very unhealthy on the U.S. Environmental Protection Agency’s AirNow website. It was not clear whether sources other than fires were contributing. “It certainly is bad enough to cause symptoms in people with chronic lung disease but also normal people,” he said. The two main firefighting agencies, the U.S. Forest Service and the U.S. Department of Interior, report spending of more than $2.1 billion so far. That’s about the same as they spent in all of 2015, the most expensive wildfire season on record. Montana is gripped by a long, severe drought. Nearly a quarter of the state, near the northeast corner, is rated as in a state of exceptional drought, the worst of five categories on the federal government’s U.S. Drought Monitor. DON’T SOME FIRES HELP THE ENVIRONMENT? Associated Press writers Matt Volz in Helena, Montana, and Andrew Selsky in Salem, Oregon, contributed to this report.